Two story building between Mission Medical Associates and Post Office, Library, etc. 1250 sq. ft. to 3750 sq. ft. spaces available in the very popular area of Biltmore Lake on the newly, widened Sand Hill Road. 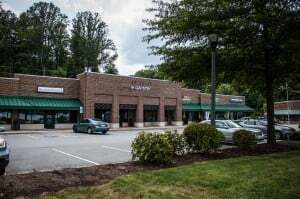 The third of three buildings in The Village complex, the other two buildings include the Enka post office, Enka- Candler library, CarePartners, a dentist practice, and a coffee shop among others. The Village is only 1.7 miles from I-40 and 2.3 miles from I-26. Units from 1250 sq. ft. to 3750 sq. ft. are available. 1. Six Buncombe County Schools within a five mile radius. 2. 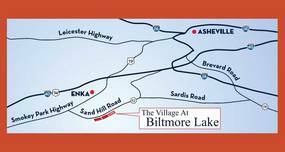 Biltmore Lake Development with 850 homes. 3. Enka library is located on the property, the fastest growing library in Buncombe County. PLUS a large multi-purpose Enka Center complex with an opportunity to own instead of lease is being developed across the street. This center will include a future county recreation area , retail outlets, restaurants, medical/office buildings, and a credit union (now open). 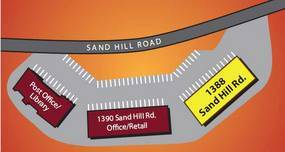 To Learn more about this complex under development, visit our site. CALL 828.274.2479 for more information.